resist water, mould and dirt. Use Lindsey Teak Protector to preserve the honey golden-brown colour of your new teak furniture from the bleaching effect of the sun’s rays. Use Lindsey Teak Cleaner to remove dirt and mildew from neglected, weathered teak and restore it to its natural beauty. Use Lindsey Teak Sealer Shield to help protect your teak furniture from dirt, food and wine stains and spills. Use Lindsey Teak Patinizer to brighten, protect, maintain and restore the unique silvery-grey patina of beautifully weathered teak furniture. We recommend a handful of water-based teak garden furniture care products to treat teak outdoor furniture. Arguably the best wood for outdoor furniture, teak is easy to maintain due to its naturally present, self-protective oils. This oil content makes teak weatherproof, water-resistant and rot-resistant so it can last a lifetime if properly cared for. 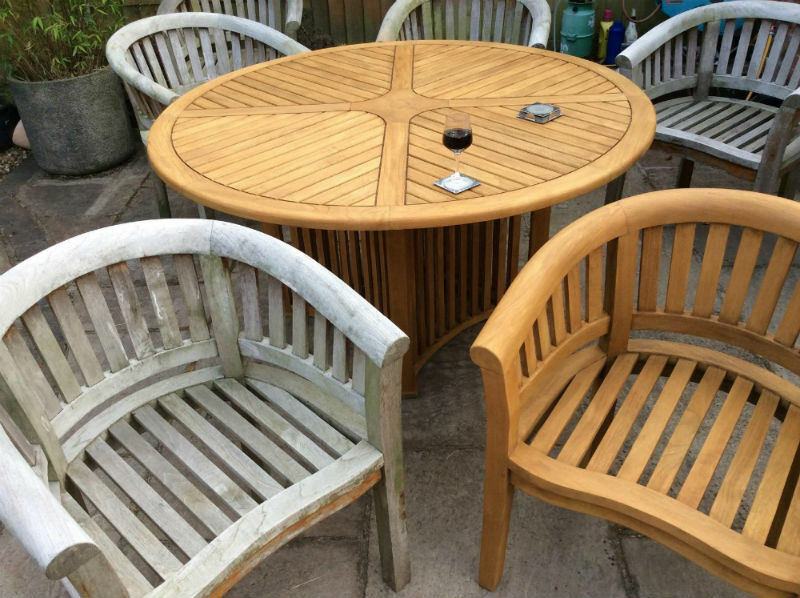 As with anything left outside, teak outdoor furniture will need occasional cleaning. 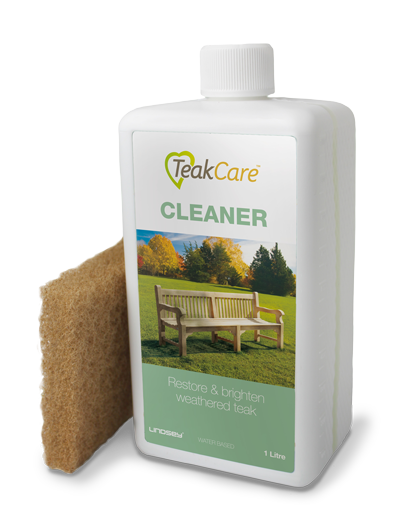 Our specially formulated Teak Cleaner is ideal if the teak requires a bit more than soapy water. Then you can use a relevant teak treatment depending on which colour you prefer. 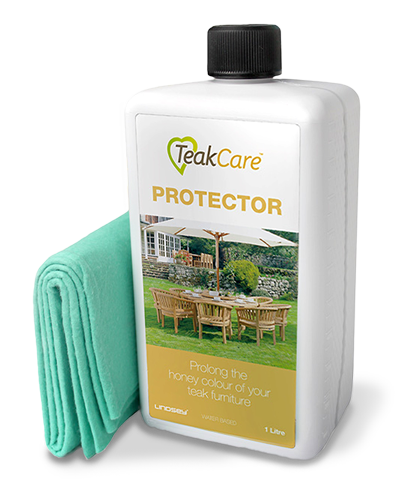 Teak Protector will protect the golden colour of new teak. Teak Patinizer will facilitate the silvery-grey hue of weathered teak. 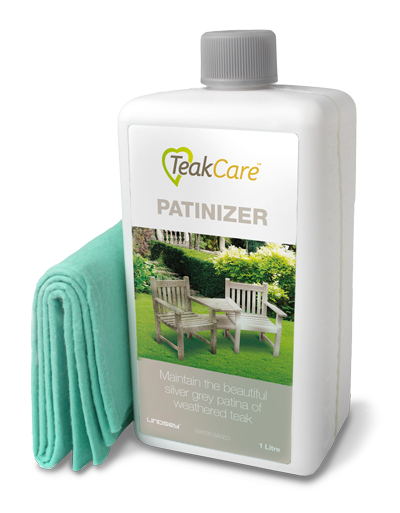 Before applying any teak care products, ensure that your teak garden furniture is clean and dry. Leave new teak furniture outside for a few weeks before applying any products. This will allow the natural oils to come to the surface. We advise against using oil-based treatments as this can destroy teak’s naturally occurring protective oils, therefore drying it out. Teak oil is more likely to encourage mildew growth and black spots. Furthermore, oiled teak will colour unevenly as it ages and requires more maintenance. Our water-based teak care products will restore, maintain and protect your teak garden furniture without causing a multitude of problems that create more work for you. If you need any further advice, take a look at our FAQ pages or give us a call and our knowledgeable sales staff will be happy to assist you.